Between 2007 and 2013, the number of people in Europe that were unemployed for over a year, doubled. At its peak, this sharp increase in long-term unemployment affected around 12 million people across the European Union. Addressing this was one of the key challenges of the jobs and growth agenda, set out in President Juncker’s Political Guidelines 1 at the time. With the economic recovery that followed, unemployment trends improved, but the job finding rates among the long-term unemployed continued to be low. In most Member States, the share of long-term unemployed among unemployed continued to increase, with dire social consequences. In this way, the Recommendation aims not only to reinforce the European Employment Strategy and the Council decision on guidelines for the employment policies of the Member States 3 , but also to complement the 2008 Commission Recommendation on the active inclusion of people excluded from the labour market 4 and the 2013 Council Recommendation establishing a Youth Guarantee 5 . In the last five years, the EU has experienced uninterrupted economic growth, which has been accompanied by a recovery in investment, stronger consumer demand, improved public finances and continued job creation, with a record-high 240 million people in employment. Reflecting this, the long-term unemployment rate has continued to decline, from 5.2% in 2013 to 3.5% on average in the EU in 2017. 6 Since the adoption of the Recommendation, the number of long-term unemployed decreased by more than 2.5 million. However, the situation remains varied across the EU and in some Member States has yet to reach pre-crisis levels. The share of long-term unemployed among unemployed is still around 45%. The Recommendation requires the Commission to report to the Council in 2019 on the implementation in Member States and at EU level. The evaluation covers all five criteria of the Better Regulation requirements – effectiveness, efficiency, coherence, relevance and EU value added. 7 The period covered is from the first half of 2015 to November 2018. Registration with public employment services (PES) is essential to receiving support for integration into the labour market. 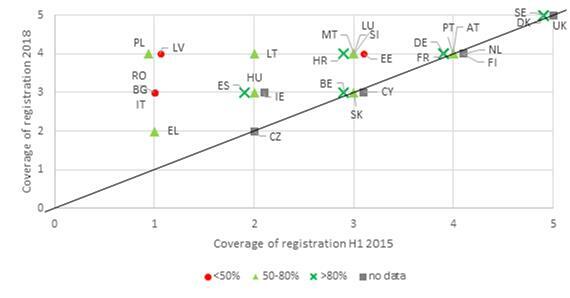 A common feature among Member States with high registration rates is benefit conditionality. Sources: Study supporting the evaluation, Ramboll, 2019. Note: Countries are coded by LTU registration rates in 2014. 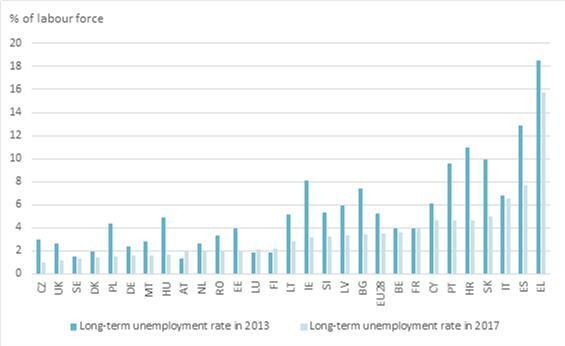 LTU registration rate is the share of long-term unemployed registered with the PES (LFS data). Since the adoption of the Recommendation, 15 Member States have improved the quality of their measures encouraging registration (Figure 3). The most common measures include providing information to non-registered individuals on the support available and outreach measures to encourage specific inactive groups. Limited capacity has been identified as a barrier to implementation. Findings show that Member States have been targeting vulnerable groups specifically (e.g. Roma, third-country nationals), both by changing existing practices and introducing new measures. However, it is not possible to conclude to what extent the measures reach these groups, or if their design and implementation are due to the Recommendation, due in part to the gaps in the quality and completeness of the data available. There is no clear evidence yet that the measures have translated into increased registration rates. Several factors outside the scope of the Recommendation could be at play, such as favourable economic trends and slow change in perceptions of the quality of services. 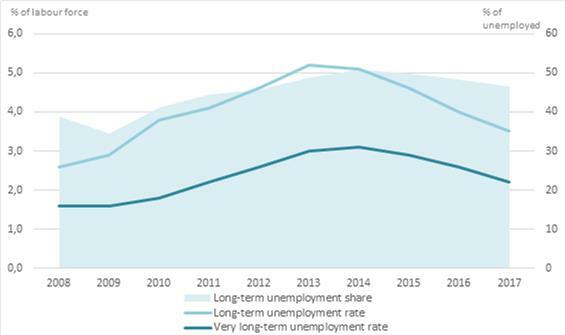 Since 2017, the PES in Malta has set up new measures targeting different, long-term unemployed groups. In cooperation with social workers, migrant associations, educational institutions and NGOs, the PES has run job-seeking advisory services for migrants and implemented outreach activities to identify and register single parents that are long-term unemployed. The Recommendation calls for all long-term unemployed to be offered an in-depth individualised assessment and a Job Integration Agreement, at the latest by 18 months of unemployment. The latter should include an individualised service offer covering employment, social and other services, as appropriate, delivered by a single point of contact. It should indicate goals, timelines, mutual obligations and available integration measures for return to work. Since 2015, the quality of measures for individual assessments improved in 12 Member States (Figure 4), including in almost all Member States that previously had weak mechanisms in place. In more than half the PES, the long-term unemployed receive more tailored individual assessments and guidance than other unemployed groups. They tend to have access to a broader set of services (e.g. motivational and debt counselling) and more frequent contact with counsellors than other groups. 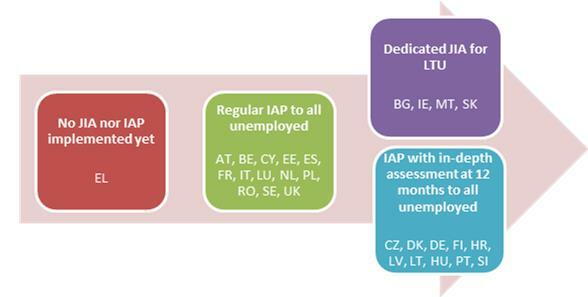 The monitoring data 10 shows that most PES provide an Individual Action Plan (IAP) to all registered unemployed soon after registration, and often at the latest by 6 months. Provided after an initial assessment, the Individual Action Plan sets out the service offer, and the rights and obligations of service provider and client. It is thus effectively the basis of the Job Integration Agreement called for in the Recommendation. Individual Action Plans are generally reviewed on an ongoing basis depending on the need. The degree of implementation of the Job Integration Agreement varies. Only half of the Member States offer a plan that includes support services beyond the typical employment-related services offered by the PES such as rehabilitation, health, long-term care, or housing services. Only half the PES conduct an in-depth assessment the moment the person becomes long-term unemployed (Figure 5). The proportion of long-term unemployed with a Job Integration Agreement ranges from 25% to 100%. The different approaches (Figure 5) do not seem to have had a major impact on transition rates yet. However, a promising trend is that countries that provide long-term unemployed with a Job Integration Agreement or an Individual Action Plan with an in-depth assessment, had a higher proportion of these individuals still in employment one year later, 11 compared to countries that only offer a regular Individual Action Plan. Croatia has developed a statistical profiling tool that helps the PES segment clients according to their distance from the labour market by estimating the probability of employment within 12 months following registration. Jobseekers at high risk of long-term unemployment are then referred to additional in-depth counselling. Coordination of services is important to address the multiple barriers that the long-term unemployed often face. The Recommendation has intensified efforts to ensure more joined-up service delivery, with 17 Member States improving the quality of their measures in this area (Figure 6). Coordination mechanisms between PES and social services – such as data sharing agreements or referral systems – now exist in all Member States, though the form varies. Data sharing practices are among the most common. These are essential in setting up a single point of contact, responsible for supporting the person through a coordinated service offer involving employment, social support services, and other services. Implementing the single point of contact has a strong institutional component. It is affected by the legal framework for sharing information on individuals and can be made more complex by different governance levels. In Finland, a cooperation model between several services allows the long-term unemployed to access a range of support. PES, the municipality that provides social and health care services, and the Social Insurance Institution that provides vocational rehabilitation, all cooperate, either from the same location, a physical one-stop shop, or from a mobile facility. Of the 15 Member States that did not have a single point of contact in place in 2015, nine have put in place or planned measures to set one up. However, the degree of implementation varies. Some Member States have put in place key elements (such as data sharing mechanisms) whilst others have nominated an authority as the single point of contact, without yet ensuring that it is operational (Figure 7). Source: DG EMPL based on supporting study and EMCO review conclusions. Since the Recommendation, 14 Member States have improved the quality of their measures to increase employer involvement (Figure 8). Employer incentives are the most common form of employer involvement. 12 All Member States now provide services to employers such as screening of candidates and placement support and a vast majority provide workplace mentoring and training (24). Developments are less widespread in support for social enterprises and post-placement support services. Employer involvement also depends on the local context, the business environment, and the capacity of social partners. Innovative approaches that involve social enterprises and NGOs are still often at experimentation level, with fewer formal arrangements in place. In France, the project Territoires zero chômeur de longue durée creates employment-oriented companies that hire the long-term unemployed on paid permanent contracts. These companies are created after an assessment of community needs. The PES provides candidates to fill vacancies, preparing them for work integration through skills trainings. In 2017, this pilot was conducted in 10 localities and will grow to 50 in 2019. Multilateral surveillance via the European Semester has contributed to the monitoring of the implementation of the Recommendation. To further support this, Member States, with the support of the Commission, put in place a quantitative monitoring framework, through which data has been collected for 2016 and 2017. The European PES Network has developed a set of quality standards for the single point of contact and the Job Integration Agreement, the basis for qualitative reviews by Member States. The PES Network has also contributed to gathering qualitative data on the implementation via a dedicated survey and the Benchlearning project. 13 However, the evaluation showed that there is scope to improve the quality aspect of the monitoring, which has been challenging given the complexity of variables and lack of certain data. The Recommendation was expected to generate economic benefits but in the short timeframe of the evaluation, it is too early to accurately assess whether these benefits have been realised. This is particularly because the full implementation of measures put forward in the Recommendation has not yet occurred at Member State level. Qualitative information suggests that in some Member States costs associated with the implementation of the Recommendation appear limited as they are mostly associated with changes in internal procedures, guidelines and processes, and/or certain elements were already in place. In Member States that implemented new actions, policy makers and practitioners had the view that costs are not excessively high in relation to the perceived benefit. Nevertheless, findings also show that, especially at regional and local level, resource constraints are a barrier to implementation. Furthermore, it is still too early to assess the full benefits of the Recommendation given that it there is a time lag before certain effects are visible. It is also difficult to fully disentangle the effects from external factors such as favourable economic conditions. It has thus proven difficult to find solid evidence to quantify costs or benefits directly related to the Recommendation in the Member States. The costs incurred at the EU level appear to stakeholders to be proportionate to the benefits of knowledge exchange and regular monitoring. The Recommendation remains relevant. The quality of support to the long-term unemployed still varies, and discrepancies in unemployment rates persist. The Recommendation has been more relevant for Member States with less developed systems, where it raised awareness of challenges and helped set the policy agenda. It is also relevant for countries with more developed systems, as changes in demography and tightening labour markets make it increasingly important that everyone that can work does. As Member States have favoured earlier action and practically all Member States provide individual assessments and Individual Action Plans/Job Integration Agreements at a much earlier stage to registered unemployed, the specific reference to 18 months as a cut-off point has become less relevant. Its provisions are also in line with the European Pillar of Social Rights 16 and the latest Employment Guidelines. There are synergies with both the European Semester and the work of the PES Network. The measures proposed in general correspond to national priorities. Member States have adopted a range of measures to encourage registration but this has not yet translated into higher registration rates. There is still room to increase targeted outreach from public services. While there is a more holistic approach towards providing individual support, the quality of individual assessments varies. This depends on caseloads and on whether an in-depth assessment with a targeted offer takes place once the person becomes long-term unemployed. There is also room for an increased focus on skills forecasting and skills assessment at an early stage to better support preventative approaches. This is important to avoid long-term unemployment coming into play as an additional factor of vulnerability. Although Job Integration Agreements exist in some form in almost all Member States, some key features are missing. They tend to include only regular employment services, a shortcoming linked to weak cooperation between service providers. Member States are making clear efforts to increase coordination of services. However, gaps remain in single point of contact implementation. The capacity of key actors to steer integration, and political backing to ensure institutional and/or legislative change, are barriers. There is also room to involve more actors in coordination agreements, particularly civil society. Employer involvement is on the increase, but financial incentives remain the most common form of engagement. Post-placement support services, and support to social enterprises are less advanced. Multi-stakeholder partnerships to ensure sustainable integration in the labour market tend also to be less common. As regards monitoring, Member States have substantially progressed in collecting data, allowing better comparability based on the Indicator Framework developed by the Council’s Employment Committee. 20 However, further efforts are required to improve the quality and completeness of the data as well as the capacity of Member States to collect information on where people are after they move out of unemployment, for example by linking different registers. In terms of EU support, the Commission has played an active role in monitoring and mutual learning. There may be room for further action to support social innovation through EaSI, or voluntary initiatives and alliances of companies supporting the long-term unemployed – the latter being very much dependent on demand on the ground. oContribute to capacity-building of different services working with the long-term unemployed, including investments in single point of contact set-up and IT infrastructure. (9) The scores are based on the mapping of policy changes undertaken by national experts as part of the supporting study at two points in time - the first half of 2015 and in September 2018. It assesses the quality of measures in place at these two moments, using a rating from 1 – 5. 1 is no or basic implementation only, and 5 is established and well-developed service/function that fulfils all the guiding elements of the Recommendation. Same applies for Figures 3, 4, 6 and 8.